After I wrote about Pete Seeger last summer, the charming, delightful, thoughtful, and generous Alexis from Knot Sew Crafty sent me a fantastic CD. It’s by a guy named Sam Hinton. It has upped the joy level for Henry, for his dad, and for me on so many car rides. I can’t thank Alexis enough for the gift of Sam Hinton! It is one of her all-time favorites, it’s now one of our all time favorites, and it quickly becomes a favorite of whoever we share it with. I can’t send you all CDs, but today I am sharing it here! Sam Hinton is great kid’s music but also great grownup music. He’s also got an inspiring life story: he was actually a marine biologist. Oh, and he was an illustrator. And a calligrapher. 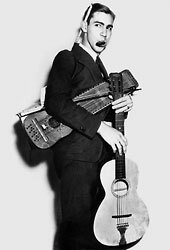 I can’t find online performances by Sam Hinton, who died in 2009. However, I did find this MUPPET version of a song named “A Horse Named Bill,” which is to the familiar tune of Dixie, and one of the best songs on the album. Along with the song about the frogs. And Miss Mouse getting married. And the one about the tin worker. And the favorite dog who died, and eating groundhogs? I could go on. I can’t figure out who wrote “A Horse Named Bill,” though Arlo Guthrie performed it, I think, and maybe the Grateful Dead, and also, look! Muppets! This is a shorter version than the Hinton. The Hinton has way more verses, and they are funny. Wow. Those are some fuzzy Muppets. It looks perhaps to be a folk song collected and published (and recorded?) by Carl Sandburg in 1927.